Many seeds require warmth to germinate and grow successfully. Such seeds will tend to perform poorly in cooler soils so it is often best to wait until a little later in the season to sow the seeds. These varieties include favourites such as tomatoes, peppers, sweet corn, beans and pumpkins. It is better to start these in containers in a protected area or bring them indoors at night in early spring. Get Started With Seeds - The Easy Way! Growing your own produce from seed is very rewarding and makes a great hobby for people of all ages. Most plants are very easy to grow from seed and annual flowers and vegetables will produce their crops within as little as 8 weeks. Larger seeds such as those of flowers like Nasturtiums, Sweet Peas and Sunflowers and vegetables such as Beans, Peas, Corn and Pumpkins are usually best sown directly into the garden where they will grow. The soil should be prepared to a fine surface, free from lumps and stones, and should be lightly moist prior to planting. Sow the seeds according to the recommended spacing at a depth of 3-6cm. Firm the seed down and gently water. Seeds that you can comfortably pick up individually are what we would call 'small seeds' and these include true favourites like tomatoes, capsicums, radishes, spinach and beetroot. These can be sown direct but in the case of tomatoes and capsicums which require warmth to germinate, they are best sown into a seed tray with good quality seed-raising mix. 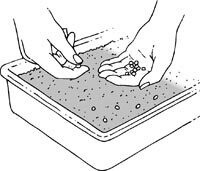 Place the trays in a warm position and keep the seeds moist but not wet until they germinate. Once they reach a suitable size, you can move them into larger pots or into the garden if the weather is good. There are some seeds such as Carrots, Lettuces, Snapdragons, Begonias and Petunias whose seeds are tiny and tricky to sow individually. Some of them are almost as fine as dust and can be sown by 'dusting' over the surface of fine, moist seed-raising mix. 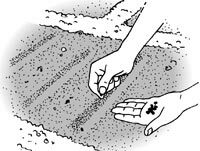 Fine-seeded vegies like Carrots can be sprinkled into prepared rows of fine soil or you can also mix the seed with fine dry sand to space the seeds out. 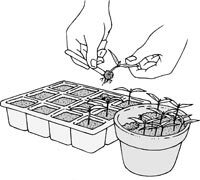 If sowing into trays, the young seedlings should be 'pricked out' or moved into trays with larger cells so that you can grow the young plants up to a good size before planting into the garden. If you need further advice about getting great results from your DT Brown Seeds, please contact our team of qualified technical advisers. We'll be pleased to assist!